Discussion in 'Vintage' started by Musicmind, Jan 16, 2019. Hi all! I just found this wonderfull forum! I would love some help, if its not to much to ask. Im currently talking with a seller in the US that asks 950 dollar for a complete set of trousers/jacket and cap. The jacket looks like this (plus some sloppy repairs to the underside of the back, the left arm has a thread that has come loose and the right arm has a leather patch+ some repaired tears to the back side. The cap is in perfect condition and the pants have 3 large tears on the right leg that have been neatly repaired. Is this the right price for the condition the pieces are in? What are the marketvalues of a b3 jacket in repaired/pristine condition? The photo you posted of the b3 looks very nice however, sheepskin from the WWII era can have weaken and rotting spots that can go unseen to the cameras eye. You should request close up photos of all of the major sections of the jacket, arms, back, front , sides, interior and repair areas. I would also want to know what was repaired and why. Was is due to rotting or just a period repair. Do that with the other two items as well. Last suggestion is that I would request a 3 day inspection period prior to the finalization of the sale for your protection. 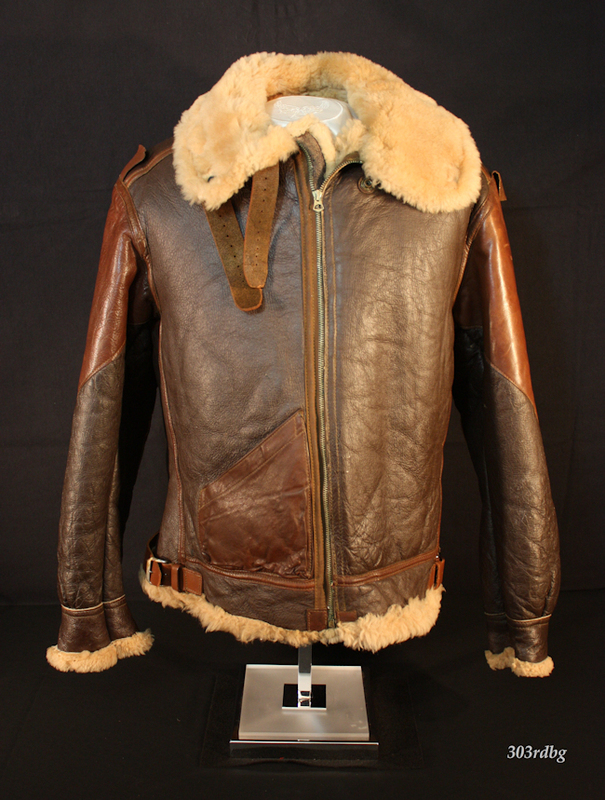 If you are intending to make this a full time wearer you may want to consider that with a sheepskin jacket, repros really can endure the day to day abuse better that a 75 or 80 original. It’s customary to introduce yourself in out members section so stop by there when you get a chance and say hi. Welcome to VLJ. By way of an introduction, why not post a bit about yourself here. I think 950usd is top top dollar for a set like this. The jackets and pants aren't rare and unless they are named to a specific individual that you can research, or are an exceptionally large size or are just that perfect, they don't bring anything like that money. $950 is not too out of line, and i would guess that the price is negotiable. $750-$800 would be a good price if the pieces are in very good condition. about wearing old shearling...dont! even if the gear looks solid, it aint. each and every original b-3 i have owned or come across was one step away from cracking, if not already riddle with fisures and or cracks. once the cracking begins, there is nothing to do to stop it, and the more it cracks and the deeper the cracks go, the crackswill go all of the way through the hide. display? sure. wear? not. Wow , i must say Im surprised by the overwhelming long en thorough responses! Very nice of you all to take time to react to my story! f you are intending to make this a full time wearer you may want to consider that with a sheepskin jacket, repros really can endure the day to day abuse better that a 75 or 80 original. I decided because of all your coments to not go trough with it . I did intend on wearing it as an regular jacket and all your response made me back away from buying it. So I saved myself from a whole lot of money and repairingcosts. So thank you for your thorough response b2. thank you for your comment! Im in a bit of a hurry right know but will to take the time to properly introduce myself, so far this forum seems to be full of people making a real effort to share knowledge which is absolutely awesome! Thanks Tom, i found this set on Ebay are there places apart from auction without websites where stuff like this is traded? I'm from the Netherlands myself so these things dont pop up on the market here. thank you for the heads up, i would have never known sheepskin tends to behave like this without all your responses, I own a lambskin jacket ( not militaria) so i kinda expected it to behave in a similar way (the jacket is in a great condition and supersoft, although not old). So thanks again all ! the reason original b-3s crack, and ultimately fall apart is that were coated with poly coating that eventually hardens. it can not be removed unless it is flaking off, and the hide skin with it. modern repro b-3 hides are tanned, and finished without a poly coating, thus there is no reason to not get 10-20-30 or more years of service from them if not hung on coat hangers, stowed away wet, put next to a heater when wet, etc. the quality b-3s made today are pretty much low maintenance.